Choosing perfect colors every time is as easy as 1, 2, 3 with the Ultimate 3-in-1 Color Tool. It's ideal for anyone who works with color — artists, crafters, graphic designers, web designers, illustrators, textile artists, interior designers, floral designers, and architects. 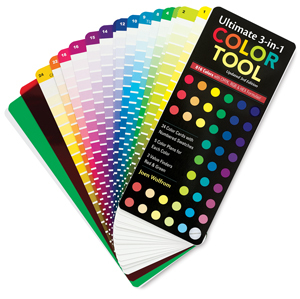 Based on the Ives color wheel, the Ultimate 3-in-1 Color Tool is easy to use. Just start with a color, choose a color scheme option, and find the corresponding companion color cards to create the perfect color combinations. CMYK and RGB formulas for 816 colors are provided, along with HEX values for website design. This updated 3rd edition of the tool includes 24 double-sided color cards, five color plans for each color, two value finders (red and green), plus an in-depth instructional guide that makes color planning easy. In a handy, take-along size (3½"W × 8"L), it's great for use at home, in the studio, or while shopping. A storage pouch with snap closure is included.